I donated in support of this campaign on Louisa Cathcart's page. "For Johnny- he inspired lives while he was with us, and even now still. And to all those whose lives are affected by cancer!" I donated in support of this campaign on Hitomi Hayashi's page. I donated in support of this campaign on Brenda Eddy's page. I Am Hiking in Honor of Johnny & To Launch New Moving For Life Classes for Young Cancer Survivors. Will You Join Me? As a 2-time childhood brain cancer survivor, Johnny has long been an advocate for cancer support and wellness. Last summer, we went to St. Jude Children's Research Hospital in Memphis, TN to participate in a long-term follow up study on childhood brain cancer survivors. We had a very special time there, reliving Johnny's old memories of being a patient at St. Jude's, and exploring Memphis and eating BBQ. Everyone in the entire hospital was so kind and friendly. It felt like such a warm and loving place and it really touched my heart. After we returned to NYC, I was inspired to do something to help the cancer community as well. Being a dancer, I decided I wanted to create a program that would share the joy of movement and dance with cancer patients and survivors. Johnny was very excited and extremely supportive of this idea too. We both knew that dance would be a powerful way to impact this group of people, as it has so many benefits for the mind, body, and spirit. Johnny encouraged me to pursue this new dream and helped me do research and reach out to friends of his in the cancer community. Fortunately, one of his friends told him about Moving For Life! Johnny emailed the Executive Director, Janice Shapiro, who was very receptive to our inquiry. She connected us with Dr. Martha Eddy, the founder of Moving For Life, who was very kind to us as well. Martha welcomed us into the MFL community instantly, inviting us to a cocktail party MFL was hosting and later taking us out for hot chocolate to talk about MFL and all of its possibilities. I decided to become a Moving For Life instructor, so I began the certification process. Johnny often accompanied me to MFL classes and really enjoyed them! He's always loved to dance, often in his own quirky way :) In MFL, he especially loved the lymphatic breathing where you say "Ha!" When Johnny passed away, I knew I had to keep pushing forward with Moving For Life, in honor of him. Johnny knew that MFL could make a huge difference in the lives of cancer patients and survivors like himself. He remembered how it felt to be a child and a teenager going through treatment and he knew that an uplifting dance exercise class like MFL could brighten someone's day and even impact their life. He'd been a cross country runner during his first two experiences with brain cancer, and he experienced the empowering feeling that exercise brings. He also knew what it was like to be a young adult cancer survivor and still have to deal with many long-term effects of his cancer and treatments. So Johnny and I dreamed of bringing MFL to children's hospitals, young adult support groups, cancer advocacy groups that he'd been involved with such as the Children's Brain Tumor Foundation, and anywhere else we possibly could. I still carry those dreams we shared, and I will accomplish them for Johnny. Team Johnny is a special group hiking with Moving For Life's Hike-a-thon. The team is aiming to raise funds for new Moving For Life classes in honor of Johnny, specifically classes for children, teens, and young adults affected by cancer. With your help, we can make Johnny's dreams come true by sharing joy and hope through Moving For Life. Thanks for helping me keep Johnny's spirit alive! New York, NY John Christian Cathcart, 32, passed away surrounded by his family on June 22, 2017. John was born on March 27, 1985 in St. Joseph, MO. He graduated from Central High School, earned his undergraduate degree in Film Production from Webster University in St. Louis, MO and his Master's Degree in News/Documentary Film from NYU. He married Louisa Brown Armstrong Cathcart on June 4, 2017 in New York City. 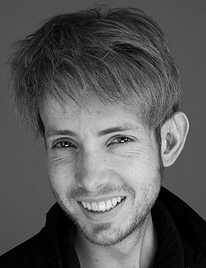 John worked as a graphic designer at Selby Hardware, and as an independent videographer for various events in New York City. He created documentary films to tell other people's unique stories of overcoming life-changing trials. He published his own story in "Hotpants: A Memoir," and was currently working on a new novel called, "Gospel Farm." He had featured articles in "Neurology Now" and "Bridges" magazines. John volunteered to help other cancer survivors as an active supporter of "First Descents," "Cancer to 5 K," "Imerman Angels" and "Angelight Films." He was a featured speaker at cancer fundraising events; Relay For Life, Make A Wish Foundation, Children's Brain Tumor Foundation, St. Jude Children's Hospital Annual Survivor's Conference, and the Comedy for Chloe Comedy Show. He was an active member of Liberty Church in NYC and volunteered in various capacities. He was previously very involved in the youth program at Wyatt Park Baptist Church in St. Joseph, and became a counselor for both Spark Weekend and Wyatt Park Summer Camp. Many of John's dreams were fulfilled: an award was created by Central Cross Country Coaches to honor him and to be given annually to a runner who handles adversity with courage and perseverance; he ran the Denver Marathon; he participated in and won awards at several film festivals, he created documentary films and musical videos that were meaningful (favorites were "Starting on the Right Foot," "The Original Batter or Batter Up," and "Brain Cancer Beat Rap"); he acted in the movie "Cider House Rules." John loved life and his favorite pastimes were playing Ultimate Frisbee, long distance running, dancing, cooking and entertaining people, literature, music, art, spending time with his family and his beloved wife Louisa. John is survived by his wife, Louisa, his father and mother, David (Rocky) and Jane Cathcart, his two sisters, Kristin (Josh) Hamilton, Casey (Russell) Sale, his nieces Grace and Kaitlyn Sale, Lucy Hamilton, his nephew Isaac Hamilton, and his grandmother Grace Hearn. TEAM JOHNNY invites you to join us and other Moving For Life Hikers in exploring the cliffside parks of northern Manhattan, traversing a total of 5 parks over 6 miles of breathtaking views of both the East and Hudson Rivers. 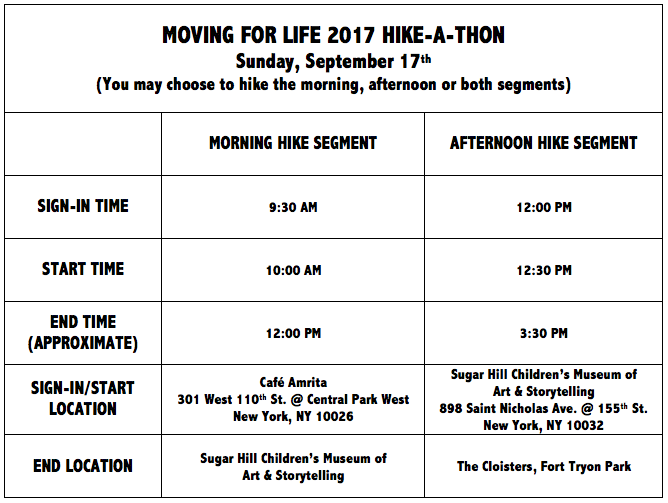 The morning hike segment starts at 110th St., passes through Morningside, St. Nicholas and Jackie Robinson Parks, and ends at the Sugar Hill Children's Museum of Art & Storytelling. The afternoon segment starts at 155th St., weaves through Highbridge Park, Swindler Cove and Fort Tryon Park, and ends at The Cloisters. You're free to join just one or both hike segments! Along the way, Moving For Life will lead health-giving stretches and teach you how to turn any park into a green gym. The best part is that every step will go towards raising much-needed funds to start Moving For Life classes designed specifically for children, teens and young adults affected by cancer! To sign up and to start rallying sponsors today, simply click Start Fundraising Now and we'll guide you through the steps through easy-to-follow directions and handy tools. If you'd like to volunteer or join the hike WITHOUT fundraising, click here to learn about our Rally-Walks & Volunteering Opportunities. Can't make it out on Sept 17th? Consider sponsoring one of our TEAM JOHNNY HIKERS at the bottom of this page, or just click the "Donate" button in the footer.